Modular Powersuits Mod 1.10.2/1.7.10 based around the idea of an inventor who tinkers with high-tech electronics and makes a suit of powered armor chock-full of useful gadgets and features. Inspired by heroes like Iron Man, Megaman, and Samus Aran, as well as by the high-tech armor in mods like EE2 and IC2. 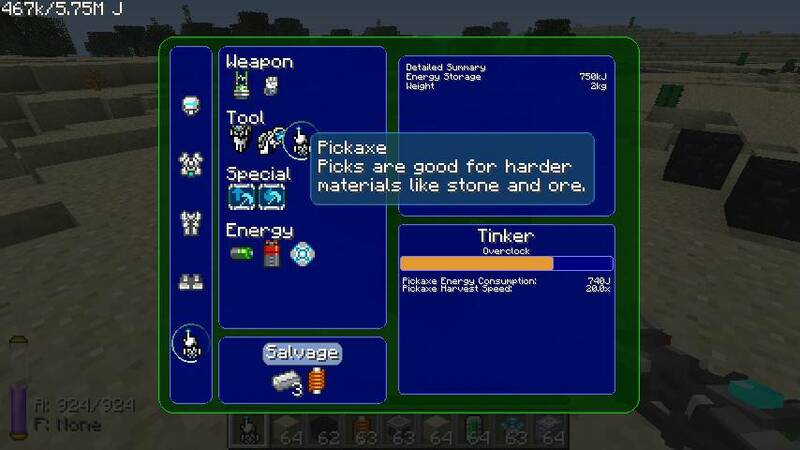 To start off with, you’ll need a Tinker Table and at least one powersuit item – the helmet, torso, legs, boots, or tool. The powersuit items are useless on their own, but when you access a tinker table, it will list the modules you can put in that item, and tell you the component cost. Recipes depend on what mods you have installed and on the config file. Server owners and modpack makers: please make sure you have only the recipes enabled that you want your players to use! Railgun: Does a lot of damage, and hitscans (instantly hits the target), but costs an exorbitant amount of energy per shot and knocks you back. Plasma Cannon: A charge-up shot that can do tons of damage as well as explode with a force of 500 millicreepers. Blink drive: Reusable ender pearl-style teleportation. In-Place Assembler: Your crafting table on the go. Multimeter: Reads the flow of UE electricity. More functions to follow! Capacitors: Allows the item to act as a UE/IC2 battery as well as power other modules. NOTE: Modules draw power from all equipped Power Armor items in your inventory, not just themselves. Energy Shield: Adds armor value and consumes energy when absorbing damage. Turns off when out of energy. Radiation Shielding: Prevents UE radioactive materials from damaging you if fully suited. Melee Assist: Add knockback and/or extra damage to the tool’s melee attacks. Pickaxe/Shovel/Axe: Each allows the powertool to act as a pickaxe/shovel/axe respectively. Consumes energy instead of durability. Aqua Affinity Upgrade: Like the aqua affinity enchantment, compensates for the underwater mining penalty. Water Electrolyzer: Consumes a burst of energy to refill your air when you are about to drown. Goggles of Revealing (WIP): Install a pair of Thaumic Goggles to display the HUD in your helmet. Night Vision: A constantly-applied and toggleable potion effect, for the low cost of 5 J/t and the new Control Circuit component. Flight Control: Tries to keep you steady in midair. Acts as a proxy for creative flight. Press ‘Z’ to go down (currently hardcoded). Glider: Lets you slow your fall speed and move forward. Parachute: Lets you come almost to a stop in midair, slowly drifting downwards. Jetpack: Allows you to add upward momentum. Jetpack is twice as strong as jetboots but twice as expensive. Active Camouflage: Acts like potion of invisibility, costs 1kW to maintain. Swim Boost: Allows you to swim faster. Sprint Assist: Makes your sprint faster, but consumes energy while sprinting. Also has an option to compensate for the fatigue incurred by sprinting. Jump assist: Hold down jump to jump extra high. Stepping assist: Automatically climb whole blocks as if they were stairs. Shock Absorber: Uses energy to compensate for a portion of velocity when impacting the ground. Jetboots: Allows you to add upward momentum. Jetpack is twice as strong as jetboots but twice as expensive. Make sure you have already installed Minecraft Forge and Numina Mod. On windows open Run from the start menu, type %appdata%.minecraft and click Run. Universal Electricity: A loosely-knit suite of open-source and highly configurable industrial mods which work well together, and are compatible with almost everything. Lots of cool stuff in here, and always being updated. Industrialcraft 2: One of the most popular and well-known tech mods in Minecraft, and a large part of the inspiration behind Modular Powersuits. A more mature and stable option.